Last weekend saw the second round ties of the South SFA Regional Cup taking place with the two matches played on Friday evening producing 17 goals. Glasgow University blew Dumfries YMCA away 9-0 while Lochmaben went down 7-1 to Edusport Academy. There were two South of Scotland League matches played with Creetown and St Cuthbert Wanderers sharing seven goals in a thrilling match at Castle Cary Park to take the three points. Saints had to play with ten men after their keeper was red carded early in the match and although striker Roman Soltys opened the scoring for the visitors who added another before Creetown struck back through Sutherland and Herries to level the match. Sutherland scored a third for the home side but two late goals from Saints secured the three points. The match at Blairmount Park where Newton Stewart and Heston Rovers locked horns produced four goals with the home side coming out on top in a game of two halves. 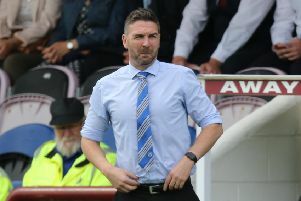 The home side dominated the early stages of the match and took the lead after 13 minutes play when midfielder Robbie Thomson crossed to Johnny Fisher who found the net. In the 35th minute provider Thomson became scorer when he prodded home a McCrindle cross as the Creesiders eased through the match. Two minutes later an excellent free kick taken from 30 yards out by defender Robert Hughan sailed past a stranded keeper to give the home side a comfortable half time lead. Eight minutes after the re-start Heston were awarded a free kick 25 yards out which was taken by Jonathon Boyd and was excellently placed giving keeper Euan Drysdale no chance of saving. The visitors then dominated but failed to find a way past keeper Drysdale as the Creesiders recorded their third victory in a row. Six of the cup ties played on Saturday involved South Clubs with Abbey Vale being up against it when they played hosts to Lowland League side BSC Glasgow but in the result of the day the New Abbey side went on to defeat their more illustrious visitors by a single goal from ex Annan Athletic and Dalbeattie star striker Graham Bell. Mid-Annandale faced recently relegated East Stirling at Lockerbie and although the home side went down 3-0 they played well by all accounts and put up a brave fight after falling behind in fifteen minutes when David Grant put the visitors ahead. It took the Stirling side until the 67th minute to increase their lead when they broke down a resolute Mids defence for Grant to find the net for goal number two. Paul Sludden though ensured victory when he scored a third. Upper Annandale entertained Whitehill Welfare and went down 5-1 with the visitors’ goals coming from Scott McCulloch and Harvey Swan both with doubles after Dale O’Hara had given them a half time lead with the opener in the 35th minute. Adam Uphill was the scorer of Uppers consolation goal. Lochar Thistle’s away match against Spartans in Edinburgh looked like one where the home side would start as strong favourites to progress in this particular competition and that was in fact the case with the Edinburgh side winning comfortably 6-0. Jack Hay scored four goals after Craig Johnstone had scored the opener in the 12th minute. Broque Watson was Spartans other scorer. South league leaders Wigtown and Bladnoch flew the flag for the South with an excellent 3-2 victory over Lowland League side Dalbeattie Star at Islecroft Stadium. Star had to play the second half of the match with ten men after Greig Thomson was red-carded and they threw away a two goal lead after Tommy Muir had given them the lead in the eighth minute and doubled the scoreline five minutes after the half time break with a header. Blair Dougan and Stuart Cluckie scored a goal each for Wigtown to send the contest into extra time when a Robert Jamieson header in the 107th minute decided the tie in favour of the visiting team. The final match was at Sanquhar where Nithsdale Wanderes played Threave Rovers in an all South tie when goals from Steven Couper and Dale Milligan added to a brace from Ben Irving was enough to see of the challenge of the Sanquhar side.